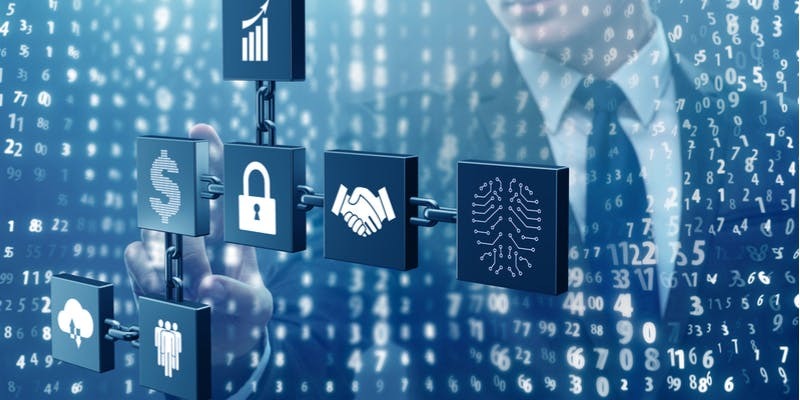 Analysing and handling massive amounts of data is a tedious task but blockchain can help add another layer of protection to the big data analytics process. Blockchain data- We have already started living in a Big Data generation. Every day, massive volumes of data are generated by different networks in different industries. This large amount of data includes the records, messages sent and received, uploaded videos, GPS signals, online data transactions, and many other sources. For some top valued industries such as healthcare, educational and banking, high-quality security and maintenance should be provided to protect this data from malware or spy. Regular analysis of this large data leads to more innovation and growth for every economic aspect. Organisations analyse the data for an optimised client engagement and individual decision-making process, which allows them to predict future trends among the others. Analysing and handling such massive amounts of data could be tedious. This is where blockchain comes into play. Blockchain helps to add another layer of protection to the big data analytics process. Blockchain-generated big data is more secure and valuable due to the network architecture by making it a perfect match for further analysis. Blockchain technology supports the bitcoins, but it can also lead to some great solutions for big data. Blockchain can be applied to any industry no matter the domain concerned with the data. Organisations hold a ledger for the records of transactions made out and so the blockchain helps form a distributed database to reach through consensus mechanisms. The blockchain is immutable, verifiable and traceable as it makes use of the hash algorithm and timestamp for transforming the low-quality data. Blockchain technology eliminates garbage data, giving higher quality and increments security too. Therefore, if applied correctly, blockchain can be the catalyst for better data resulting in better outcomes. The first obvious space to apply blockchain to big data is finance, as every transaction offers a level of anonymity and data is not kept private. It is possible to find different patterns for transactions for Bitcoin transactions by linking those to people. Multiple organisations have started working on such solutions, and it has helped avoid crime. But beyond finance, Big Data is a digital database technology that can be applied to any industry. Today, e-commerce businesses have started to implement blockchain by storing granular transaction data to understand its interactions with producers and consumers. Retail giants like Walmart are also using blockchain to increase food safety by increasing traceability and managing daily data to ensure its reliability. Blockchain also has immense potential in the healthcare industry where the bulk of data is generated by the reports and case studies that are private and confidential. Google DeepMind and NHS are joining hands in the UK to use blockchain for storing encryption-free patient data. It will be used to create a verifiable data audit ensuring that the data used for research purpose has appropriate permissions. Are companies keeping secrets about big data ROI?